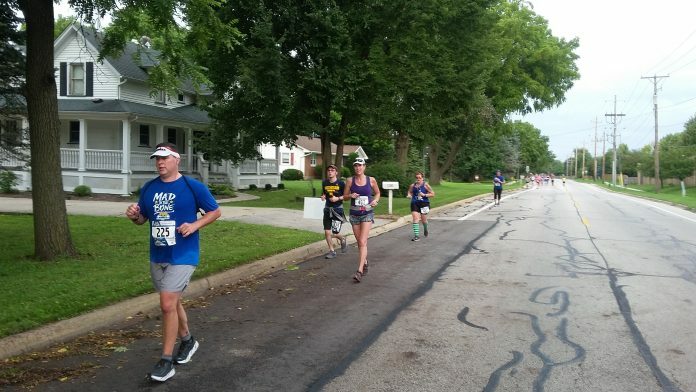 On Sunday morning, the quiet streets of Batavia were woken with the running of the 11th annual Half Madness Half Marathon. This event, which starts near the Fox River in downtown Batavia, helps raise funds for the Batavia Food Pantry. I ran this race a few years ago and was familiar with the scenic course, or thought I was until I learned that the finish line was moved to another location about three-quarters of a mile from where previous races finished. This was due to construction work being done in the area where the race ended in past years. The course takes runners north on city streets before crossing the river and heading north for almost two miles before crossing the river again and heading south for another mile or so. Runners then turn west and make their way through residential streets for approximately four miles. Although we ran through and past many streets, road traffic was very light. This is always a welcomed relief when you don’t have to compete with vehicular traffic for a piece of the roadway. My guess is that folks in Batavia were enjoying their Labor Day weekend Sunday sleeping in late. As we approached mile seven, we left city streets behind and made our way onto the Fox River Bike Trail. This portion of the route takes us south for about three and a half miles into North Aurora where we crossed the Fox River again and turn north to the finish line about two and a half miles away. This last half of the course is very zen-like; I found my mind drifting as I looked out onto the morning mist covering some parts of the Fox River and watched wildlife along the river’s bank. I kind of lost sense of my pacing, but it didn’t matter — I just wanted to take in all the scenery along the way and enjoy the moment. The new course ended in a wide-open grove with plenty of room for finishers, family members, and volunteers to hang out. I preferred this finish line to the previous course that seemed congested and compact in size. The race announcer called many runner’s names as they approached the finish line bringing smiles to finisher’s faces. Runners received their finishers medals and walked over to the refreshment area for a cold beer, water and some snacks. I talked to some runners, took some pictures, did some stretching and headed down the trail for the walk back to my car. I ended up walking the distance along side Bowen Tucker (Bib #164). At age 80, he was the oldest finisher in this race; when we first started talking I thought he was much younger. He told me about his joy of running and staying active and how he had participated in five of the last ten Bank of America Chicago Marathons. He told me about how he was just happy to be outdoors getting exercise and was grateful to be able to continue being active at his age. His enthusiasm for the sport was infectious and his words of encouragement to just enjoy the experience of it all and not get bogged down in details of final time or place were uplifting. We shook hands and parted ways as we got back to our vehicles. My conversation with Bowen was the topping on a great morning and a great race. I would recommend this event to anyone looking for a relaxing run on a scenic course. You’ll find a couple of hills along the way to add some spice to this mostly rolling course and interesting people that might just inspire you. Previous articleBit by the Tri Bug: Now What?